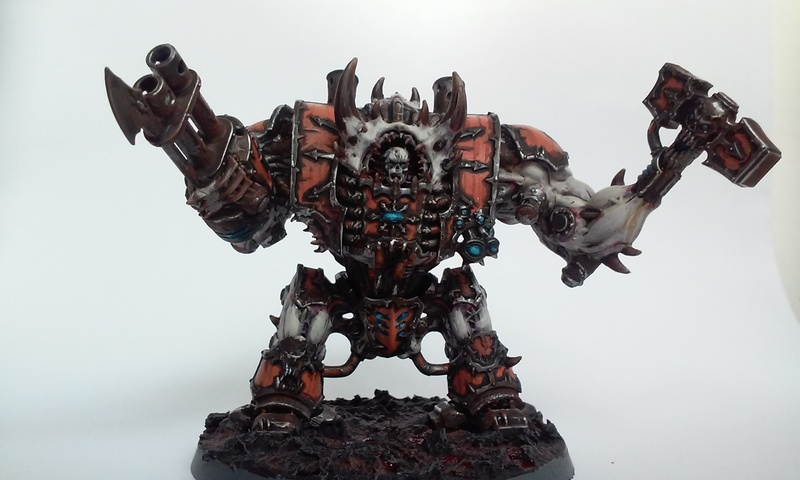 First Captain Rizgar of the Silver Skulls Space Marines Chapter had been tasked with the destruction of Gul Valon, the Butcher of Kurigath. His assembled strike force of first company brothers struck hard and Rizgar shortly found himself face to face with the arch-traitor. Rizgar’s Thunder Hammer cracked of energy as he charged. Like two mighty giants the men clashed. The challange was furious and brutal. But in the end the First Captain could not withstand the fury of the Traitor Lord. Gul Valon stood atop of him as he laid on the ground. The Daemon Axe roared for blood. Rizgar felt life leaving him. He had failed his mission. He had failed God-Emperor. Feelings of shame and guilt overtook Rizgar as he faded into the cold embrace of death. But it was his own agonizing screams drag him back to the living. He had not died. Or at least; he had not been allowed to stay dead. Had it gone weeks? Months? Or even years maybe? All he knew now was his corrupted prison of torment and pain. His iron will corroded and insanity besat his mind. All that he once was had been consumed by unbound hatred and visions of carnage and destruction. 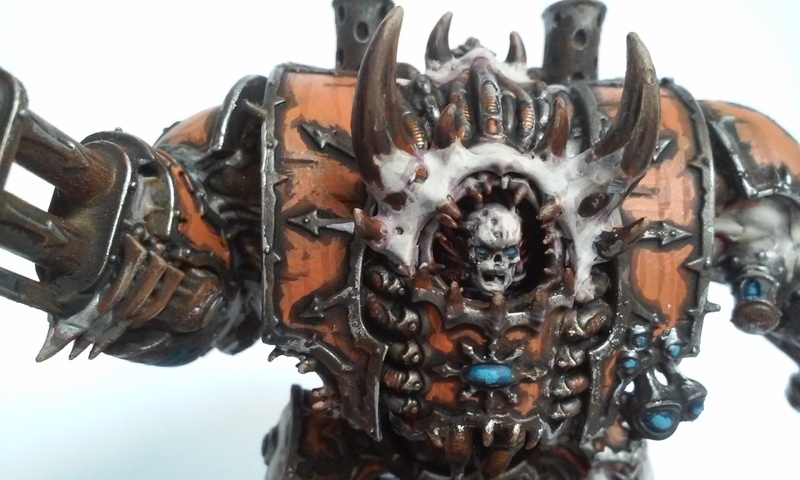 Rizgar, First Captain of the Silver Skulls, was now truly dead. 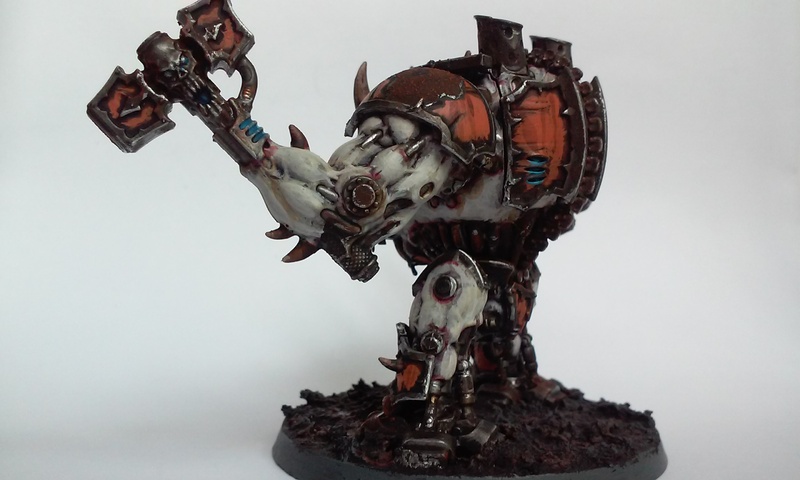 All that remained of the fallen champion was Rizgar the Tainted; Helbrute. I made it. 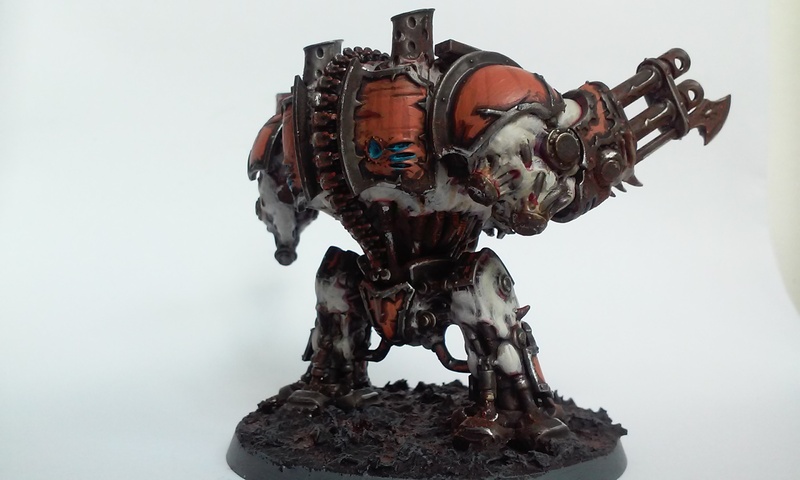 I finished my second Helbrute. 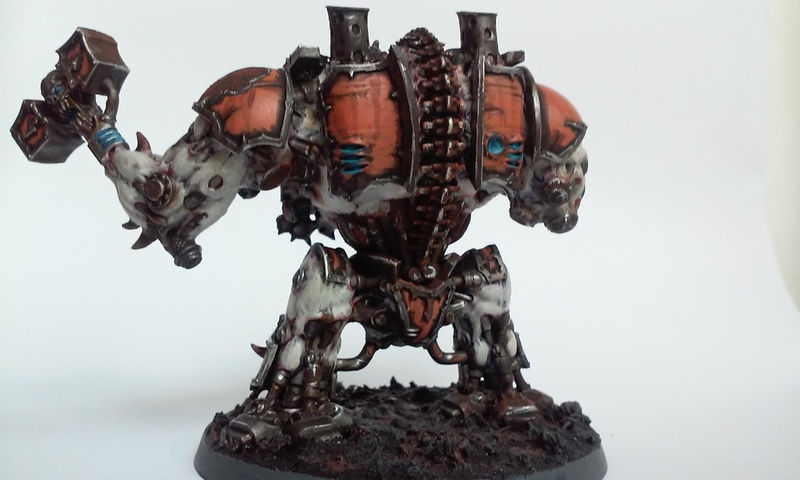 I’m happy I got it done before #DreadTober ended. 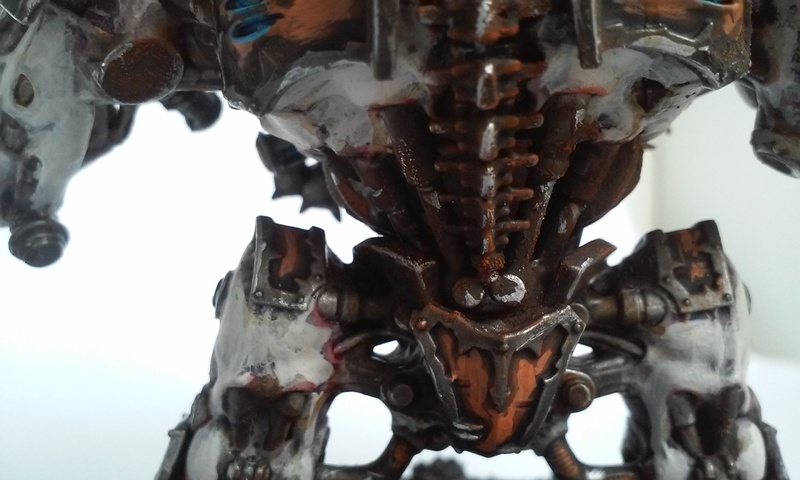 The Helbrute is not my best work to date, I know I rushed it a bit and cut some corners. But I’m pleased with the overall result. It looks really cool on the table top. Lets look at some pictures (they are a bit dark, sorry about that). You…you did two. *holds his sprues in his hands and cries*. I wish I had something else I could give you! Thanks so much for the awesome work and participation! Thanks Greg. You know, you been doing so much updating of everyones work and giving feedback all over the place … it’s just incredible. The rest of us just need to focus on painting. I’m impressed by your commitment to the community. It has taught me, that the next time I do this, I need to just concentrate on running the event, and not trying to paint. It’s quite difficult to handle the two simultaneously, because though checking out everyones work is inspirational, updating it all is a time sink! (And I have only so many hours to hobby a week). I can’t even begin to imagine how much time you spent on the event. Well done and thank you, it’s been a blast. I’ve seen so many cool walkers, so much awesome work. 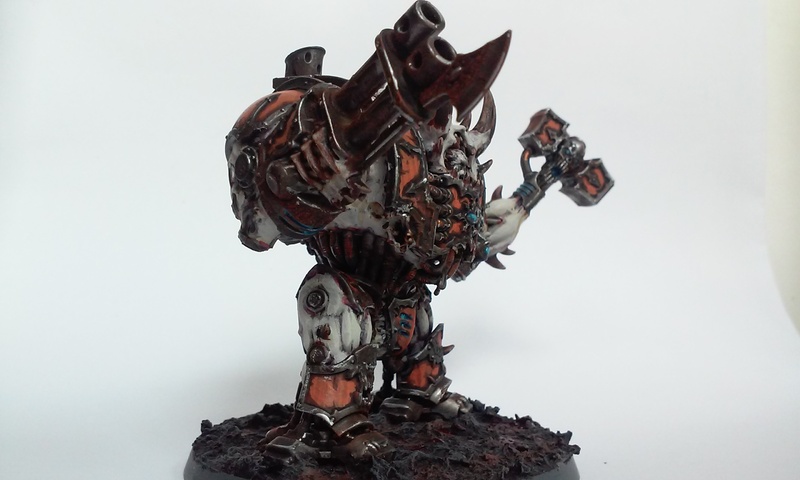 One of these days a new codex will drop and Helbrutes will dominate … eh, be decent … once more. 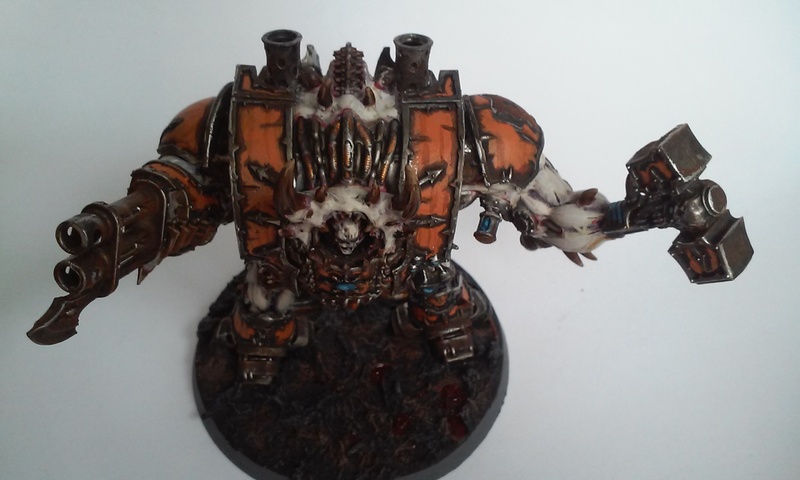 I’d love to see Helbrute gain in power. It wouldn’t take much. 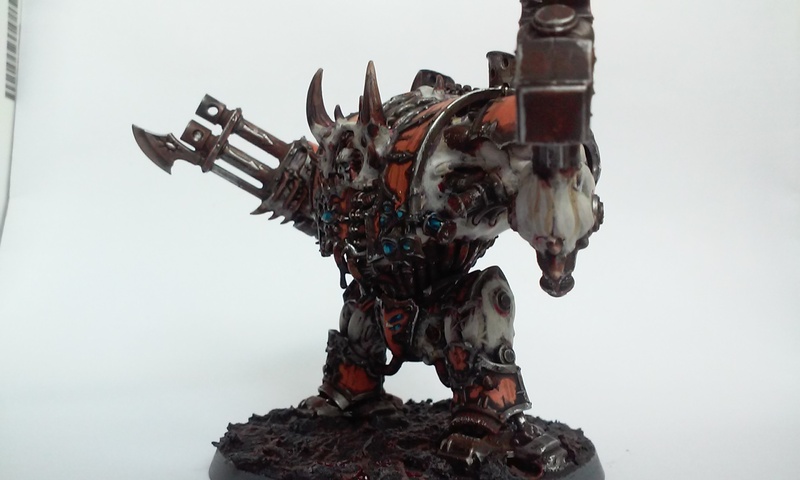 A few extra attacks, maybe marks, tweeked Crazed table, a bit cheaper and why not a Alpha Helbrute option. That would rock! And ork dreads! Together at last! I keep hoping, especially since loyalist Dreadnoughts got so damn good at no real extra cost. Cheers Alex, it had been sitting on the shelf for far too long. I’m glad I finally got around to painting it. Spectacular model mate. Your painting skills are incredible. Speaking of hammer time, I once drew a picture of a hammer on my hammer at work and declared to everyone “hammer time!” Only one person laughed…and that was me haha. Thanks buddy. I do the best I can with my painting skills. I’ve refined my style to fit my skill level. Sorry drew a picture of a clock on my hammer. My damn brain is too foggy with hammers and warhammers and MC hammers sheesh!! !